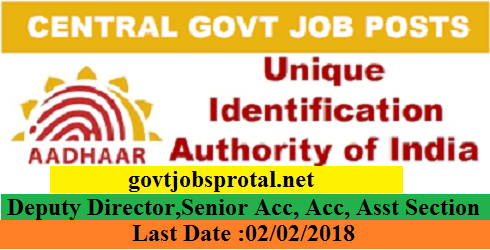 Subject: Vacancy circular for the posts of Deputy Director (DD), Senior Accounts Officer (SAO), Assistant Accounts Officer (AAO), Accountant, Private Secretary (PS) and Assistant Section Officer (ASO) on deputation basis in UIDAI, RO, Hyderabad. and Government of India’s instructions issued from time to time on the subject. 2. Having professional degree of CA or ICWA. The officers appointed in the UIDAI will be eligible for General Pool Residential Accommodation at par with Central Government employees. 3. Eligible and Willing candidate may apply through proper channel in prescribed format - Annexure I. Cadre authorities/Head of Departments are requested to forward applications of eligible and Willing candidates whose services can be spared on deputation immediately on their selection. 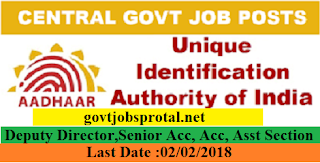 The applications of suitable and eligible officers complete in all respect, in the prescribed format (Annexure-I), along with documents listed in para 3 and 4 above may be forwarded to Shri N. Satyanarayana, Assistant Director General, Unique Identification Authority of India (UIDAI), Regional Office, 5th Floor, Block-III, My Home Hub, Madhapur, Hyderabad - 500 081. The last date for receipt of applications complete in all respect is 45 days from the date of issue of this Notification in the Employment News (i.e. on or before 5" February, 2018). Candidates who apply for the post will not be allowed to withdraw their candidature subsequently. Since this vacancy is to be filled up on deputation basis, private candidates are not eligible.